One of the prettiest districts of Rajasthan, a trip to Bundi is a trip into the rich history and heritage of Rajasthan. Dotted with monuments which remain even today as silent witnesses of an age gone by, a holiday in Bundi is a definite must have if you are planning a tour itinerary to Rajasthan. The district, which maintains its place as one of the premier tourist destinations of Rajasthan also provides perfect accommodation facilities to the various tourists who arrive on a tour to Bundi. 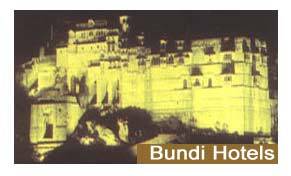 Thus, if you planning a vacation in Bundi, you can, choose from a wide range of the hotels in Bundi, to make the most of your stay in Bundi. By Rail :- Bundi is well connected to the other cities of the region like Kota, Neemach (MP), Chittaurgarh, and Delhi by rail. By Road :- Smooth roads which are maintained well connect Bundi to a number of the other important cities of Rajasthan and its neighboring provinces. Indiahotelandresort.com offers online room booking at various hotels in Bundi and other cities of Rajasthan.